The fall brings andreline filled oppurtunities to catch these exciting and prolific fish. 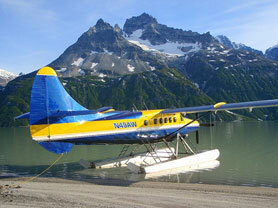 Bear viewing and Flyout Fishing Packages. King Salmon fishing and Bear viewing all in a days work. Get your saltwater fix and put away a big fish for the freezer. 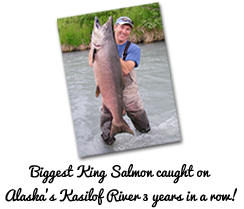 Kenai OutfitterS: Specializing in Kenai River and Kasilof River King Salmon - Silver Salmon - Sockeye Salmon - Trophy Rainbow Trout - Halibut - Floatplane Fishing/Bear Viewing! 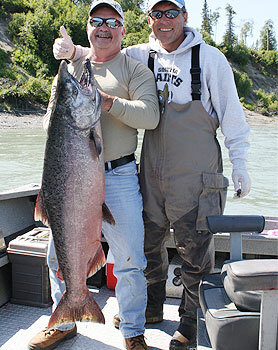 Kenai Outfitters specializes in catching the Big Alaska King Salmon! We offer Alaska fishing charters & Alaska fishing vacations at their Best! Go fishing on the Kenai River for Kenai King Salmon, and enjoy fishing on the Kasilof River with our expert Alaska Fishing Guides! Flyout by float plane and enjoy the flightseeing on your way to some of the best Alaska fishing the state of Alaska has to offer. Go fishing with Alaska grizzly bears and some of the Alaska wildlife. Alaskan Brown Bear viewing trips with or without fishing are an excellent Alaskan adventure! Fantastic photography opportunities! 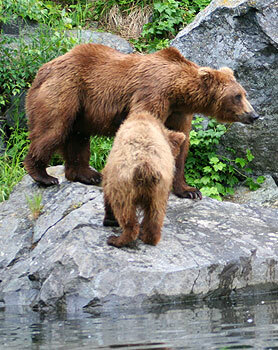 Alaska Bear Viewing Flyout Packages are a very popular attraction. The bears are spectacular and are sure to be the most memorable part of your Alaska fishing vacation. Get the best of both worlds, Alaska flight seeing on the way to and from your fishing destination, and Salmon fishing with the Kenai Peninsula Brown bears! When you're not fishing you're likely to be taking pictures of the bears. Since we're in a boat we often times are very close to the bears. However, only if the guests are comfortable with being close to bears. Whatever is your preference we'll do it. You'll definitely want to bring your camera and plenty of film for this trip. Handicap fishermen welcome, fly in our very comfortable floatplanes, catch big Alaska Salmon from our boats and view Alaska Brown Bears up close from the safety of your boat! 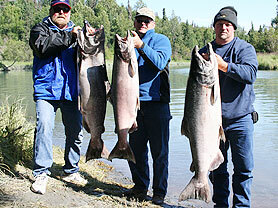 Kenai Outfitters Also Fish's The Nushagak River For Alaska King Salmon!! Alaska Day Fishing Trips And Overnight Fishing Trips Are Available. This Is A World Class Alaska King Salmon Fishery And Landing 10 To 30 Alaska King Salmon Daily Is The Norm. This trip is fully outfitted. Lodging, great meals, hot showers, guide and the best King Salmon Fishing in the world! Contact Us to Find Out More.... We'll See YOU On The Nushagak River!! Fly-in Fishing is pure reality and not another dream! Give us a call or send an email to learn more about this fantastic fishing opportunity. It is recommended that you book this trip early as it is very popular and availability is limited. BOOK THE BEST FISHING DATES FOR 2019 BEFORE THEY'RE GONE!